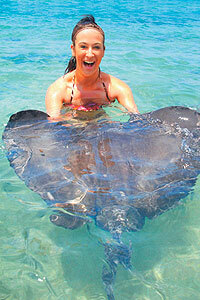 Stingray Beach Cozumel - Snorkel with Stingrays! Get ready for an amazing day at Stingray beach, it is an amazing Cozumel excursion where you get to hold, touch and even feed real live stingrays! Breathe easy, their barbs have been removed so it's totally safe, and oh so fun! Feel their "Hoover-like" mouths on your hands, it's really exciting! After your stingray encounter, you can go snorkeling with the stingrays and of course lots of beautiful tropical fish too! Watch the resident critters provide additional entertainment while relaxing in all of our beach facilities for the rest of the day. The beach facilities features tables, umbrellas, chairs, shops, and restrooms. Only a few minutes from downtown and the cruise ship piers! Hold, Touch, Pet, and even Feed Live Stingrays ! Enjoy All-Day Use of Beach Facilities! When: Arrive when you want, leave when you want! Stingray swims start at 8:30 AM, then every hour on the hour from 9:00 AM to 1:00 PM. You'll need to pre-book a time to swim with the stingrays, but you can still come and go as you please from open to close. Where: Stingray Beach is located on the coastal highway just 2 minutes from downtown. Duration: Stingray Encounter lasts 1 hour. You can use all of our beach facilities as long as you want! Beach hours are from 8:30 AM to 5:00 PM. Choose the time you would like to do your stingray encounter. You can still use all of our beach facilities all day long, but you'll just need to say when you want to do your actual stingray swim. Cruise Passengers: Yes! This tour makes a great shore excursion. However, it is not available to guests of Carnival. If you are on this ship, please select another activity. Note: For your safety, you'll get into the water only during your stingray swim. Before and after your swim you can enjoy all the beach facilities from the shore. Taxis are lined up waiting for you as you get off the ship. Very easy. Should cost about $8.00 USD from the cruise ship piers.